 Agarwal, Sameer, Noah Snavely, Ian Simon, Steven M. Seitz and Richard Szeliski. “Building Rome in a day.” ICCV (2009). Choy, Christopher Bongsoo, Danfei Xu, JunYoung Gwak, Kevin Chen and Silvio Savarese. “3D-R2N2: A Unified Approach for Single and Multi-view 3D Object Reconstruction.” ECCV (2016). Fan, Haoqiang, Hao Su and Leonidas J. Guibas. “A Point Set Generation Network for 3D Object Reconstruction from a Single Image.” 2017 IEEE Conference on Computer Vision and Pattern Recognition (CVPR) (2017): 2463-2471. Wang, Nanyang, Yinda Zhang, Zhuwen Li, Yanwei Fu, Wei Liu and Yu-Gang Jiang. 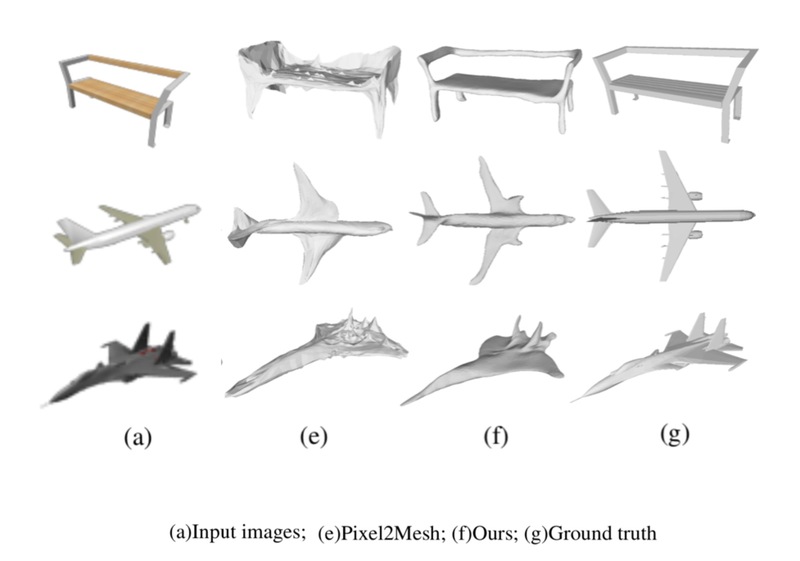 “Pixel2Mesh: Generating 3D Mesh Models from Single RGB Images.” ECCV (2018). Chang, Angel Xuan et al. “ShapeNet: An Information-Rich 3D Model Repository.” CoRR abs/1512.03012 (2015): n. pag. Wu, Shihao, Hui Huang, Minglun Gong, Matthias Zwicker and Daniel Cohen-Or. “Deep points consolidation.” ACM Trans. Graph. 34 (2015): 176:1-176:13. He, Kaiming et al. “Deep Residual Learning for Image Recognition.” 2016 IEEE Conference on Computer Vision and Pattern Recognition (CVPR) (2016): 770-778. Ronneberger, Olaf et al. 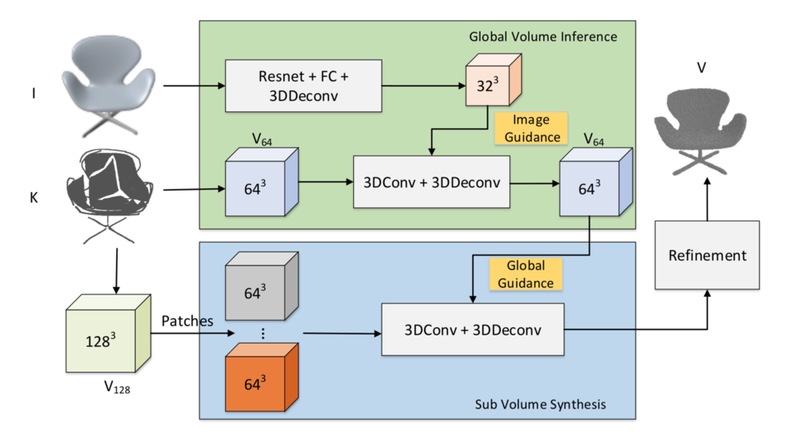 “U-Net: Convolutional Networks for Biomedical Image Segmentation.” MICCAI (2015). Lorensen, William E. and Harvey E. Cline. “Marching cubes: A high resolution 3D surface construction algorithm.” SIGGRAPH (1987). Kobbelt, Leif, Swen Campagna and Hans-Peter Seidel. “A General Framework for Mesh Decimation.” Graphics Interface (1998). Simonyan, Karen and Andrew Zisserman. “Very Deep Convolutional Networks for Large-Scale Image Recognition.” CoRR abs/1409.1556 (2015): n. pag.